The Haftorah is read from three of the twelve short books in Trai Assar (The Twelve Prophets): Hoshea (Hosea) 14:2-10; Yoel (Joel) 2:11-27; Michah (Micah) 7:18-20. The Connection between this week's Parsha and the Haftorah: The ten days starting with Rosh Hashanah and ending with Yom Kippur are called The Ten Days of repentance. The Shabbat that falls in between the two is called Shabbat Shuva or the Sabbath of “returning” to Hashem. Shabbat Shuva takes its name from the 1st word of the Haftarah. Once again the Haftorah is not connected to the Parsha, but it is connected to the time of year it is read. The Storyline of this week's Haftorah: The Call to Repentance -The first portion of the Haftorah is read from: The Book of Hoshea. "Shuva Yisrael ad Hashem Elokecha" "Return, O Israel to Hashem, your G-d", for you have stumbled because of your sins. Confess to Hashem and return to him. Ask Hashem to forgive you. Stop the external reliance from other nations and pagan deities. Hashem gives word that the rough years are over and Hashem will be rejuvenating the people and the land of Israel. The second part is read from: The Book of Yoel. Hashem has the Prophet Yoel inform the Jewish people that a plague of locusts will come and destroy all who are not observing his Torah. Hashem says however that even at this late hour it is still possible to do "teshuva" (repentance), but only if they do it wholeheartedly with fasting weeping and lamenting. Hashem is patiently waiting for them to return to Him. Hashem will now cause the agriculture of Israel to blossom tremendously. Yoel informs the Nation of Israel that Hashem is going to provide tremendous blessing in the way of food, that people will be startled. They will go from having nothing to having it all in a very short period of time. The last portion of the Haftorah is read from The Book of Micah. Hashem is forgiving of Bnei Yisroel’s sins, for He is kind, and merciful. May the promises he made to our forefathers be fulfilled. "The meaning of his name is “salvation." Hosea’s prophecies took place from 760-720 B.C.E., about 2700 years ago, while King Solomon’s Temple was still standing in Jerusalem and before the 1st exile, of the 10 northern tribes by Sancherev, King of Assyria. He told Hashem “If you don’t like the way the Jews are behaving, choose another people”. Hashem didn’t like that and told him to marry Gomer, a woman who he loved and was unfaithful to him. Gomer was from Dibla’im. Before Hosea was married to her, she was a harlot. They had 3 children. A daughter LoRuhama, Object-of-no-mercy, because Hashem had decided to no longer be merciful with the Jews who refused to repent, and two sons: Lo-ami, Not-my-people, because the Jews had forfeited their claim to being the Hashem's "Chosen People", and Jezre’el, The-G-dof-powerful-mercy-will-plant or Hashem-will-gather-in-the-exiled-Jews-and-plant-themin-their-homeland. Hashem instructed Hosea to send his family away. Hosea couldn’t stand it. Hosea died in Babylon. Hosea desired to be buried in the Holy Land at that time when the journey to Palestine was beset with much peril. Thus, He requested before his death, that his coffin be loaded on a camel and for the camel to make his way as he would. Where ever he stopped, there Hosea was to be buried. So it was done without a single mishap. The camel arrived in Sefat at the Jewish cemetery of the town. The camel stood still and there Hosea was buried in the presence of a large crowd. The name Yoel (Joel) means, "Hashem is G-d."
He was the son of Petuel. His most prominent vision is of a cloud of locusts approaching the land of Israel and of the destruction it would cause. He assures Bnei Yisroel that the benefits of the Jews doing teshuva (repentance) is that Hashem will have mercy on us and that He will bless the land of Israel with prosperity. In the Last chapter of his book Yoel describes what will happen in the messianic era. The Book of Yoel is 4 chapters long and is the 2nd book in the Trai Assar. The name Michah (Micah) means, "Who is like Hashem?" He was from the city of Moreshet Gat a village in the lowland near the Philistine border. Spoke out against the moral and social evils of his day. He denounced the pursuit of wealth that led to mass corruption. 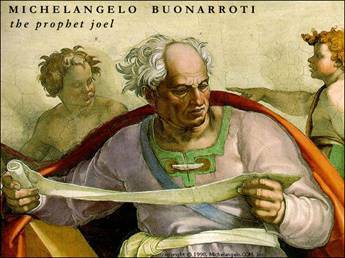 He was the first prophet to predict the destruction of Jerusalem. Wrote the 6th Book of the Trai Assar. The last two Pesukim of his book are included in the Tashlich service said on Rosh Hashanah. Haftorahman's Lesson of the week: The words of the prophet Hoshea are a loving call to do teshuva (repentance) then and now. Even though the nation of Israel repeatedly sinned, their essence is basically good and pure. Hashem treats us as if we are not hopelessly evil, just that we have stumbled a little bit into sin. The potential for repentance always remains, and Hashem is always ready to accept it and forgive us. Teshuva constitutes three parts: Regret of the sin, confession of the sin and a promise to never do it again. It is very important that when one sins and longs to be forgiven that one accomplishes all three parts of teshuva. Famous phrases from the Book of Hosea: Chapter 2:21- "Ve'erastich li le'olam, Ve'erashtich li be'chesed uvemishpat uvechesed uverachamim, Ve'erashtich li be'emunah ve'yada'atah et Adoshem", “I will betroth you to me forever, I will betroth you to me in righteousness, with justice, with kindness and mercy, and I will betroth you to me with fidelity and you will know Hashem. 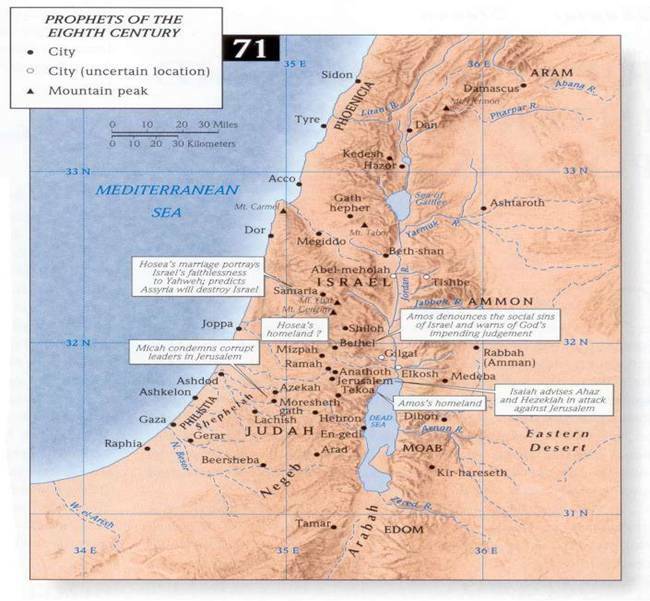 Map: The prophets in this week's Haftorah prophesied in Jerusalem. Timeline: This Haftorah takes place about 2600 years ago.